The Donkey Kong Board is a board that appears in Mario Party 10. 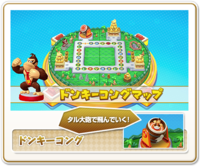 It is available exclusively in the amiibo Party mode, where it can be played on when the Donkey Kong amiibo figure is scanned on the . Like all other amiibo boards, the Donkey Kong Board is based around a certain character, who in this case is Donkey Kong. The board takes many of its elements from the Donkey Kong Country series of games. Jungle trees, wooden posts, stone statues, a Mine Cart on rails, and even Donkey Kong's House can be seen on the board; a recreation of Donkey Kong's sprite from the original Donkey Kong can be seen on top of a jungle temple. The giant Barrel Cannon can be hopped in by the players, presumably to reach another part of the board. Mounds of bananas sit on top of three pedestals. When a player lands on an Event Space next to one of these pedestals, they can play a minigame with three barrels to earn coins. This board's music is a remix of the Jungle Hijinxs music from Donkey Kong Country. Characters with confirmed figures can collect icons of different characters and change one quadrant of the board to resemble the relative quadrant of the board based on the character on the icon. When passing through the area in the top-left corner, the player gets a choice to shoot themselves to one of their opponent's locations. Lower left corner: 1, 2 or 3 coins. Higher right corner: 1, 2, 3 or 5 coins. Lower right corner: 1 or 2 coins. The recreation of the Donkey Kong sprite is similar to one that appeared in Donkey Kong Country Returns. This page was last edited on January 3, 2018, at 20:40.